Kwanzaa is and has always been a time for reflection, growth, and planning for the future, through the lens of seven principles. For us, reflection is the process of using the past as a vehicle to learn. Analyzing our past gives us a sharper clarity on our position in the present. Recognizing struggles and challenges of the past can be difficult and uncomfortable but they provide an immense opportunity for growth. This new found growth that comes from reflection, introspection, and thought makes it truly possible to place for the future. Any struggles, mistakes, and obstacles of the past become lessons in the present, and lessons always provide hope for the future. 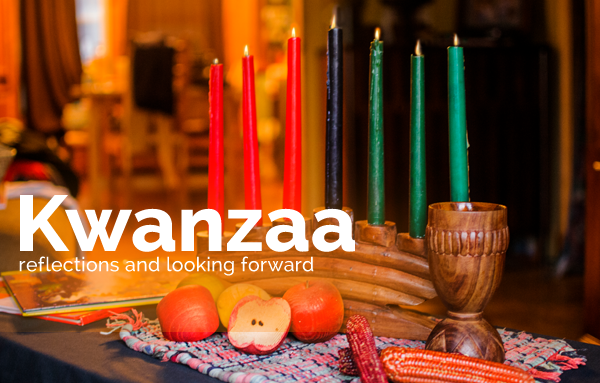 The goal of Kwanzaa is to brainstorm a new way to evolve and uplift the community by considering all things that have come before. In spirit of this, we’re reviewing the rollercoaster that was 2017 in order to assess the climate for the black community and evaluate the most effective ways to create change in regard to the 7 principles of Kwanzaa: Umoja, Kujichagulia, Ujima, Ujamaa, Nia, Kuumba, Imani. 2017 has been a racially charged year, placing the spotlight back on the question of the current state of racism in America. Race has been brought back into the conversation thanks to the protests, and walkouts, and counter rallies where we have advocated against injustices towards the black community and highlighted the patterns and systems of oppression. We saw this unity, or Umoja, amongst NFL players, coaches, and owners who joined arms and knelt in solidarity with Colin Kaepernick. Colin Kaepernick is the ex-quarterback for the San Fransisco 49er’s who used his platform as an influential athlete to open up a conversation about bringing an end to police brutality. Originally, Kaepernick had sat during the anthem, but began kneeling over a year ago in 2016. Kaepernick stated that he would not “stand up to show pride in a flag for a country that oppresses black people and people of color”. The protest was met with backlash and resentment from some, but signs of support from others. The controversial climate cost Kaepernick his career, as suddenly no team would sign him in part because of the conversation his protests brought to the NFL. Throughout the scrutiny, harassment, and backlash, despite costing his own professional career, Colin Kaepernick was determined to do all he could to use his voice to end the oppression of black people. Kaepernick exemplifies Kujichagulia – his conviction to do what was right didn’t waver at any turn and no matter the cost. As a community, we understand it is up to us to look after ourselves and part of that is working cooperatively to hold ourselves accountable for making true change. That is why we push each other to be the best we can and continue to make and provide any opportunities for change. One of the most valued vehicles for change is education and partnerships with The Karen Hunter Show, Michael Baisden, Joblogues, and Urban Intellectuals have allowed us to create a hub of education and conversation for the community on important topics including financial literacy, saving tips, and smart money habits. We’re extremely grateful for our partners and their dedication to the mission of restoring the black community and creating black wealth. May the new year bring us all more opportunities for Ujima and that our collaborative efforts will make a difference in the lives of people in our community. Cooperative economics is the main principle behind our #BankBlack and #BuyBlack movement. Annual black spending totals $1.2 trillion as of 2017, this money however never sees any benefit for the community because the money is spent elsewhere at larger businesses and chains owned by predominantly whites. The idea behind buying black and banking black is exchanging the money within the community first, providing jobs to in our community, increasing the average income, bringing more opportunity for more business endeavors and expansion and then spending that increased purchasing power on more than behemoth businesses with no interest in the community. Hosting fundraisers of our own is also another application of cooperative economics, Ujama, because we can all compile resources to fix a cause. For example, the Change4Change Radiothon, hosted by Power 105.1’s The Breakfast Club raised $700,000 towards initiatives focused on ending sexual harassment as well as institutional and systematic racism. 2017 has brought many highlights but it has also brought about many struggles. Natural disasters and events outside of our control have occurred and plunged people into suffering, causing numerous setbacks. Though, in trying times it is invaluable to be able to still pull hope from the obstacles we face. The present moment we are in has and will always be shaped by lessons learned from the past. Learning and educating ourselves on our past will help us prepare for the future. We use history to examine what has happened in the past. We use history to understand how time has compounded issues of the past and complicated our present. We use history to map out our future. We can use history, the struggles of this and past years, to remind ourselves of our Nia or purpose as we set goals for the future. Any problem is simply just one creative thought away from a solution. As we plan and move forward it’s important to not only voice but listen to creative solutions to problems in our community. Allow your creativity to be inspired and stimulated by what others have done, this year celebrities and influencers have been especially creative about their way of joining protests, causes, and fundraisers. Jay-Z used his audience to support Kaepernick’s action to protest by wearing a custom Colin Kaepernick Jersey on-stage during a concert. Jay-Z also took time out of his own concert to highlight the Meek Mill case as an example of institutional racism and how the justice system preys on blacks and black youth to fuel their prisons. Eryka Badu also used her influence and appeal to spread awareness and carry support by taking a knee at the Soul Train Awards. Creativity, Kuumba, can be the way we craft our message and the way it’s delivered. Artist Addonis Parker’s moralistic art evokes creativity down to the infinite universe of hope and potential deep inside the eyes of one of his creations “Doonie”. In order to create the change we seek we must not lose our Kuumba. Faith – Imani, is the final principle of Kwanzaa but its importance is emphasized because the final step in this reflective process. This is because faith is one of the most important takeaways and feelings that should arise after surveying our past and present for ideas for the future. As 2017 comes to a close, we should be filled with faith for the New Year. Filled with faith that we are on the right track, that we understand our past and present, and that we will come up with the creative solutions for change. Our faith, Imani, will translate into confidence and our confidence will translate into progress. We thank you all for being with us in 2017, reflecting with us during the Holiday season and we hope that you are all excited for the new year as we are. are you preparing the people for cryptocurrency? I hop you are . please don waith on what you don't know and say i whish is knew. please start with black people. I will help you. Hello my name is Amado Adams I am 49 years old I have 7 kids total,2 younger and 5 are grown I have had an account with bank of america,regions,and SunTrust and I've tried to apply for a small loan to get life together and every time I was turn down and yes I understand I have bad credit but most of that is from 25 years ago so how do I get ahead if no one give me a chance by giving me a loan and at the time of requesting the loan I was working full-time jobs just trying to make ends meet so my question to One UNITED is if I establish an account with you guys could I apply for a loan withen a year or 2. Thank you for sharing this info and making a platform foe our community. Im glad to be a member of this bank. I have sent an email re: how to move an existing IRA from another bank to One United. I live in NJ and want to do my part to invest in us. Please advise. Good Day, you can reach out to our Customer Support team here: https://www.oneunited.com/customer-service/contact-us/ or call them directly at (877) 663-8648. They can provide you with the information you need about moving existing accounts over to us. Thank you, this is the ground work of Kings and Queens, Thank you!!!! Dr. Maulana Karenga is GOD. Greetings - I am so inspired and excited about #BuyBlack and #BankBlack! I live in Virginia and my question is What is required to open up a branch here? There are many interested in the idea of our very own bank. Continued Blessings and Success!